The motto at HKG estate wines is ‘Honouring the past, handcrafting the future.’ ‘The past’ is instantly apparent to anyone who visits, due to the three iconic kilns of the Hop Kiln winery that tower over the rest of the estate. The Hop Kiln dates back to 1905, when it was built to process hops that were cultivated on farms around the Healdsburg area. Over the years, hop growing ceased, and the historic barn and kiln were converted to a bonded winery which used the grape vines that had grown on the ranch since the 19th century. Since the first vintage produced in 1976, the wines quickly became known for their artistic proprietary blends. The next generation of excellence came to light with the introduction of their ultra premium label, fondly referred to as ‘HKG’ (Hop Kiln Grown). In 2006 the property was planted with mostly Burgundian brood: Pinot Noir, Chardonnay and Pinot Grigio. Coupled with meticulous care by winemaker Chuck Mansfield and vineyard manager, David Smith, the result was all-estate, award-winning HKG wines. You might think that Chloe, HKG’s diminutive wine dog, may feel a little overshadowed by the towering kilns on the property. 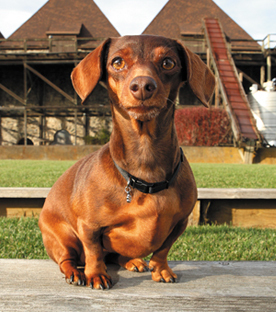 But, being a larger-than-life character, the Miniature Dachshund is oblivious to her tiny stature and can often be found racing around in search of any lizard that has the nerve to be on her estate!